Bali is the largest tourist destination in the country and is renowned for its highly developed arts, including traditional and modern dance, sculpture, painting, leather, metalworking, and music. Since the late 20th century, the province has had a rise in tourism. Bali is part of the Coral Triangle, the area with the highest biodiversity of marine species. In this area alone over 500 reef building coral species can be found. For comparison, this is about 7 times as many as in the entire Caribbean. There is a wide range of dive sites with high quality reefs, all with their own specific attractions. Many sites can have strong currents and swell, so diving without a knowledgeable guide is unadvisable. 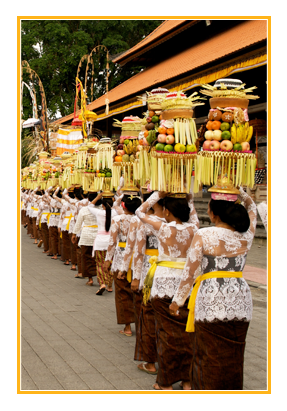 Bali is the host of 2011 ASEAN Summit, 2013 APEC and Miss World 2013. Bali has a tropical climate with average temperatures of 31 degrees Celsius. Although rainy season is between October and April this should not discourage a visit especially as downpours are very often limited to only part of the day and offers relief from the sun to explore. Dry Season between April/May and September brings blue skies and a perfect time to visit if you are particularly looking to enjoy a relaxing beach holiday. With a population recorded as 3,891,000 in 2010, the island is home to most of Indonesia’s Hindu population. In the 2000 census about 93.2% of Bali’s population adhered to Balinese Hinduism while most of the remainder follow Islam. It is also the largest tourist destination in the country and is renowned for its highly developed arts, including dance, sculpture, painting, leather, metalworking, and music. Bali has won the World Tourism award for the Most Popular Island Destination in the world. Put simply, Bali is magical. In a world where tradition, religion and family are often stifled by modern day life, Bali’s ancient and individual culture is plain for all to see, in fact it positively bursts out colorfully from every corner and cannot be ignored. It is easy for even the first time visitor to catch a glimpse, or even be involved, in the life of real Bali in a way that we are seldom able to do in other destinations where local life is often hidden behind tourist attractions.